WeedEnder® Engineered Vegetation Control products provide the best vegetation and weed control landscape fabric on the market today. WeedEnder® will not puncture and break down like most landscape fabrics available for commercial use. Your customers will appreciate that our vegetation control products even carry a 20-year warranty. 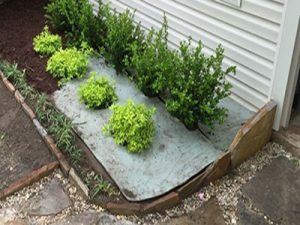 Whether using WeedEnder® for flower beds, or hardscapes, your customers can rest easy knowing that WeedEnder is completely inert and will not harm shrubs, trees, flowers, or water gardens. Other great uses are fence lines of all types, grape vines, fruit trees, and vegetable gardens. WeedEnder® is also used as an erosion control measure and in drought tolerant landscapes and hardscapes . 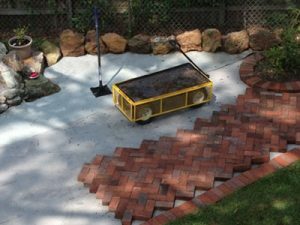 WeedEnder was used on this brick paver patio project for a few reasons. Its eliminates weeds, roots, and insects from coming through the cracks on the pavers, but it also serves as an excellent stable base for pavers and stonework. When planting shrubs and plants, WeedEnder can be used as a template to help evenly space the placement of plants prior to digging. WeedEnder can be drawn upon prior to cutting out openings for the plantings and then covered in a decorative mulch or other material. Fence lines are a great use for WeedEnder. Not only does it make the appearance of the fence neat and tidy, it cuts maintenance time down to a fraction. 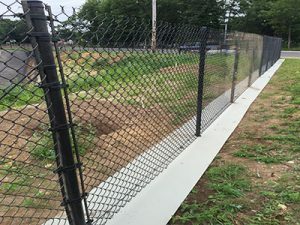 WeedEnder can be easily installed on new and existing fences.